The mains flushing project began with a request from Atkins Global in 2010 for a unit to replace their current turbidity monitors. 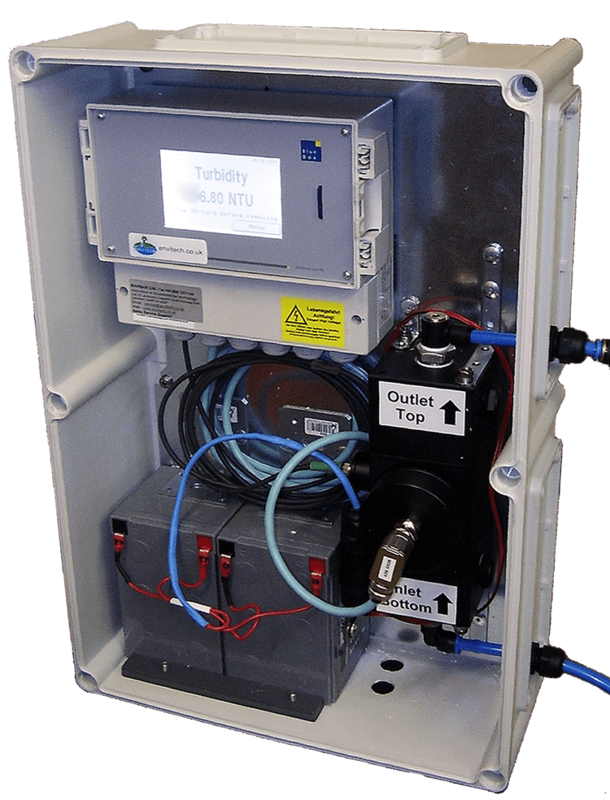 Our task was to find or devise a portable logging turbidity flow-cell system. Previous mains flushing turbidity monitoring equipment had proved unwieldy and unreliable . The older system depended on a laptop being permanently connected for data acquisition. Our remit was to improve on the old units. We turned to one of our suppliers, GoSys Elektronik in Germany for help. Go-Sys already had a flow-cell nephelometric turbidity sensor and a transmitter that would work from 24VDC with built-in SD card logging. We initially made a 24VDC prototype using 2 bulky 12V batteries. We received the original email request in June, by August we had assembled the prototype and sent it to the client for testing. On behalf of our clients, we requested an option for 12VDC to make the logger more portable. The original target requested by the client was for a system weighing less than 16kg. The prototype weighed in at around 13kg, but removing a battery took off 4kg, giving us a final weight of below 10Kg. We sourced a rugged case, and developed internal fittings to hold the flow-cell and battery, with the idea of attaching the touch-screen transmitter to the outside of the case. In the meantime, we asked the manufacturers to tweak the software for us to cope with the possibility of data corruption when a rechargeable battery loses charge. This took us to November when we were able to supply the finished 'Mark One' model to the client for testing on mains flushing projects. We settled on a 10mm bore system with standard 'hozelock' connectors for the flow-cell. We attached them using bulkhead style fittings for easy connection/disconnection to the stand pipe. A recharging point for the battery was also provided in a bulkhead fitting. This ensured that the system could be recharged whilst running. However, the capacity of the 12V, 12Ah battery proved easily adequate for over 12 hours continuous operation. Additionally the capacity of even a relatively small (4GB) SD card allowed for thousands of datapoints even at the requested 15 second data intervals, allowing for storage of years of continuous data if needed. 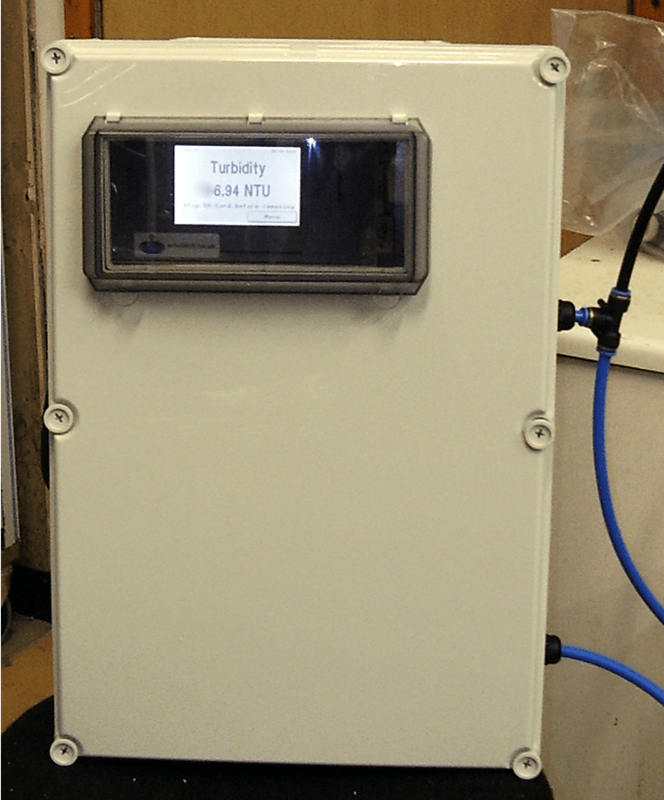 The system delivers accurate turbidity readings allowing the user to confidently judge when the mains flushing process has been successful. Data is collected from the SD cards and logged to provide a record of flushing activity. Using the data points logged, it is possible to see how effective the flushing process has been. Importantly for our clients, the rugged build and removing the need for a portable computer, means that the unit can be left operating in muddy puddles without detrimental effect. Envitech has continued to support the equipment by providing annual validation and calibration of the units, while continuing to develop the product and provide training and support to users. Battery Life: Under test conditions, 12Ah batteries proved effective for 12-18 hours continuous use. We can use smaller capacity batteries (6Ah) to save on the overall weight of the unit. 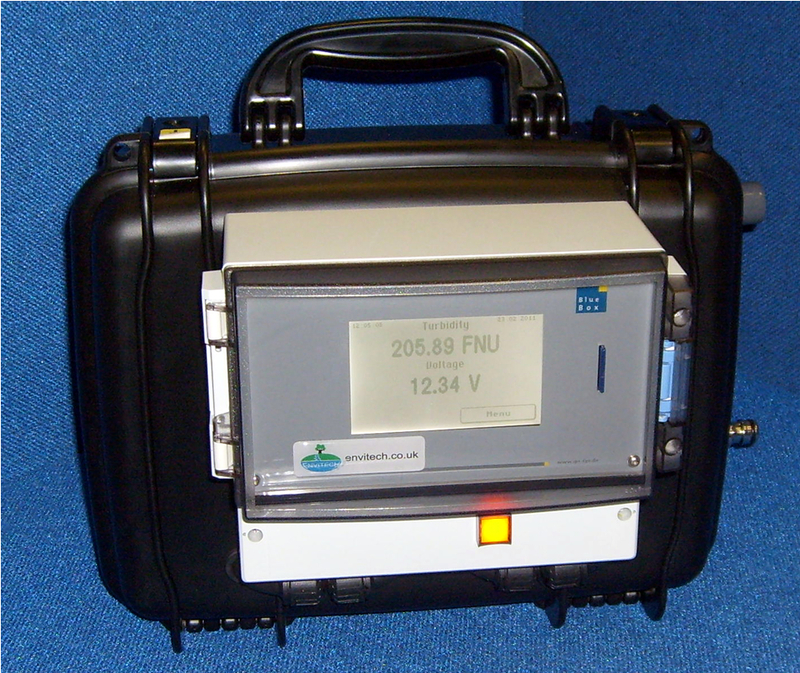 Although not generally used for this portable application, the transmitter unit has digital and analogue outputs built in.